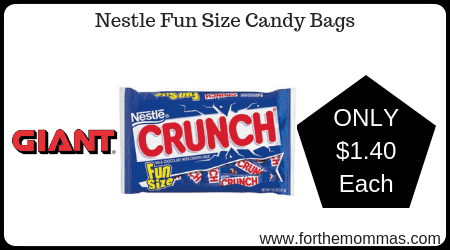 Giant: Nestle Fun Size Candy Bags Just $1.40 Each Thru 10/18! Thru 10/18, Giant has a great deal on Nestle Fun Size Candy Bags. It is priced at $2.00 each, plus we have a $2/3 Nestle Fun Size Candy coupon insert to use on this deal that will make the final price just $1.40 each! Note: There is a catalina printing for Nestle Fun Size bags that hasn’t been confirmed at Giant yet.